As the President of HEG and a former Head of School and experienced consultant, I've developed countless strategic plans for a numerous private and public schools. I even completed my graduate degree in strategic planning for schools. So I truly understand what is involved in developing strategic plans as well as the implementation and roll-out of the plan completed. 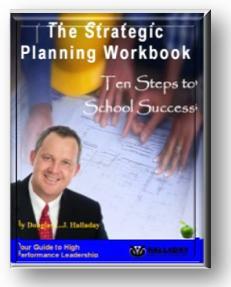 Our firm’s proven 10-Step Strategic Planning Toolkit provides you with an effective model and system that builds ownership of your plan within your school community and allows you peace of mind when you're the facilitator of the plan’s development. I've been in your shoes, so I developed the toolkit just for you that take you step-by-step through the entire process. I’ve even given you my PowerPoint for presentations. Springboard your school to the next level. Focus on excellence actually it focuses you on being ‘exceptional’ …why settle for excellent!! What Can You Do To Ensure Your Success In Developing And Implementing A Plan? You have the keys sitting right there in front of you...you just need to reach out and unlock the door to your school’s success. You clearly know that there are areas in your school that need to improve to create an effective school, but you’re hesitating. Well don't wait! You've the chance to create a blueprint for the development of an exceptional school and to become one of the top institutions…with an enriched curriculum, a waiting list, empowered staff, focused board, energized administration, happy, smiling students (who re-enrol), and proud parents who brag about their child's education (remember word-of-mouth is still the No. 1 recruiting tool). As the President of HEG and former Head and Superintendent of numerous private schools, and a successful Consultant, I’ve constantly looked for practical information on how to develop and implement effective strategic plans for schools I've led and advised. I know from my graduate work on Strategic Planning at San Diego State University, there is a right way and a wrong way to develop a plan that transforms your organization. You don't want one that just goes through the act of planning for planning sake and is then put up on the shelf to collect dust. But I was really frustrated. 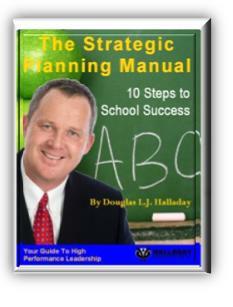 There wasn’t allot of information on strategic planning specifically for private schools. Sure, there was information for corporations, public schools, and even a little for not-for-profits. But it was too broad, too vague, or there wasn’t enough information to help the needs of real private schools…where you have to deal with fundraising, finance, human resources, marketing, admissions, recruiting, facilities, grounds, boarding, curriculum, public relations, technology, start-up business plans…and then planning and implementing it all out over the next five-years with your own team. On a few occasions I had hired very, very expensive consultants to develop strategic plans at the schools I led…Co-Ed, PreK-12, Preparatory, Boarding, All-Girls, Equestrian, IB, Start-Ups, International ESL, Special Ed…pretty well every kind of private school there is. And I received every kind of plan…some good, some bad. I spent tens of thousands of dollars and attended every workshop, read every book, article, journal, and speaker on strategic planning (probably just like you), and developed an exhaustive library concerning the critical elements on strategic planning. When I chose to start my own firm to provide solutions for private schools like yours, I pulled together my years of experience developing strategic plans and researching the best models and established our own top-rated strategic planning program based on our team’s years of experience, graduate research into the most effective models and systems that will work for schools like yours. As a former private school leader, and one that has also done his own graduate level research on strategic planning, and one who’s developed his own strategic plans and successful models for numerous schools as a consultant, and as one who’s hired the best to do it, I’ve decided to put aside months of my own time to develop the complete “How To” Toolkit for private school and non--profit leaders to develop their own strategic plan. What I’ve done is take the very best from every model and system there is on strategic planning, address every question there is, and provide the most complete toolkit on the market that enables you to develop, implement, monitor, and revise a strategic plan for your own private school. What's In Our Manual? Click Here ! Our “Workbook” provides 36 worksheets for you fill out, which provides everything you need to develop, implement, monitor, and evaluate your own strategic plan. What's In Our Strategic Planning Toolkit? 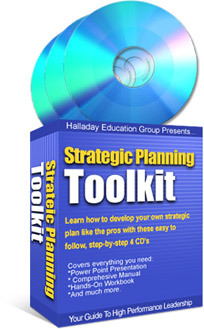 This Toolkit contains a comprehensive digital copy of our Workbook, Manual, Course, my entire Power Point presentation allowing you to effectively facilitate your own planning process, my Inner Circle MP3 Presentation on the how-to’s of strategic planning, a complete set of worksheets to walk you step-by-step through the entire strategic planning process, enclosed in your own limited set of eBooks on the "10 Steps To School Success". As a bonus we're also providing $1,000 worth of bonuses to you when you buy the toolkit. You'll get the following: Four $500 critique certificates that allow you four hours of my time over the phone and in writing to bounce your questions off of me or to seek guidance with how to develop and implement your strategic plan. Granted, the Strategic Planning Toolkit is not inexpensive. But we look at it this way – if you were to retain a consulting firm to provide their services to develop a strategic plan for your school, they could charge you a minimum of +$15,000.00. By putting everything we do and know, all the tips, tricks, short-cuts, and critical steps into one exhaustive Toolkit, you get ALL our skills, experience, and knowledge for just $99.97 USD plus applicable (that’s less than what I charge an hour!! ), and you save $14,900. To me that seems like a reasonable price then. You get +30 years of our experience, for 1/300 of our fee. But in all seriousness, I know as a former Headmaster and Superintendent, you have to count every penny. Running a fee-based private school is different than anything else. Once you enrol the students, that’s your capital for the school year. I wanted to charge a fair price that reflects what this valuable package can do for your school, and what my true value is. And I think I’ve struck a fair value. The Toolkit will be available online immediately upon payment.